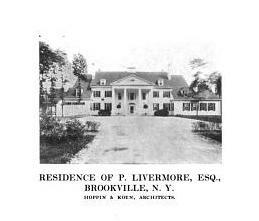 'Bois Joli', the Phillip W. Livermore estate designed by Hoppin & Koen c. 1910 in Brookville. Livermore, a stock broker, hit and killed someone with his car on East Shore Road in Port Washington in 1933. The NYTimes article mentioning the incident, which was said to have been unavoidable, also points out that he was "no relatives" of Jesse L. Livermore. The estate was later purchased by Joseph Wright Harriman who in 1918 hired Alfred C. Bossom to design alterations to the residence. Harriman renamed the estate 'Avondale Farms', click HERE for more. He was a nephew of railroad financier E.H. Harriman. The residence was demolished c. 1950. Photo from The New York Architect, 1911.
nice to see before it got bloated by the Harriman additions.